Nearly two years after introducing Graph Search, Facebook has added significant smarts to its advanced search feature, letting users track down posts previously shared with them. 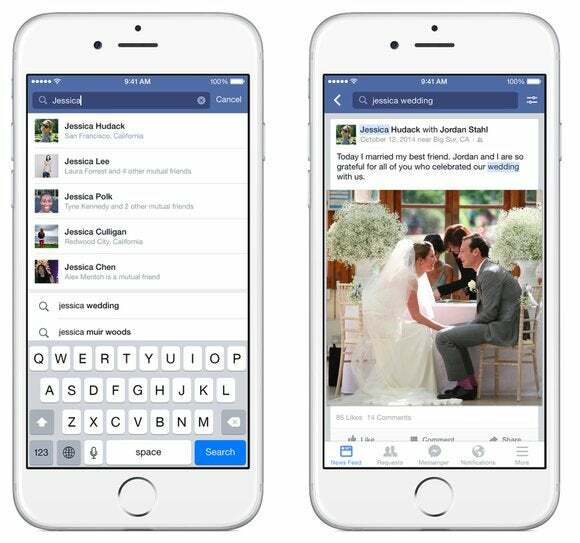 Facebook users can now search for specific posts, including news articles, photos, and videos. It’s a long overdue feature the company’s been working on since it announced the development of Graph Search in January 2013. Graph Search was conceived to let people search for content posted on Facebook using plain English queries, such as, "New York restaurants my friends like." But a post search tool is rolling out after feedback from people who said it was more important, Facebook said in a Sunday blog post. In the search box, users can type, say, “Jessica’s wedding,” and the posted photos from her wedding will appear, assuming Jessica was nice enough to share those photos. Previously, a search like that may only have surfaced Jessica’s profile, or a relevant page or group. Meanwhile, if users still want to do a search like, "My friends who live in New York," they can, Facebook said. The update is rolling out this week for U.S. users on iOS and desktops. There was no launch timeline announced for other platforms, including Android or Windows phone. Privacy settings will play a key role in the usefulness of post search. If someone posts something but only shares it with specific friends, the post will only appear to those friends who search for it. Still, there will probably be users who want to limit the search on some of their posts. Users can adjust the privacy settings around their posts by clicking on the “activity log” button from their profile page, on either mobile or the desktop. And, if you want to look back at your own searches, go to your activity log and check the box for "include only me activity." Facebook CEO Mark Zuckerberg has called search a long-term effort for the company, with more improvements on the way. Still, for a company that prides itself on being mobile first, it’s surprising it took nearly two years for some of Graph Search’s functionalities to make their way to mobile. With enhanced search, Facebook hopes to keep its users engaged and away from rivals, which are improving their own search features. Just last month Twitter began letting users search for every tweet ever posted. Pinterest now lets users tailor their searches through its "guided search" tool.